Google Celebrates Its Birthday! Finally! The return of the old logo, with exclamation point, reminds me of a fact that’s so obvious it’s easy to forget: Google gave its company a name that was almost explicitly inspired by Yahoo, which had an exclamation point first and retains it to this day. I’m not sure when Google lost its one, but it was presumably whacked in part to make sure that Google and its branding didn’t come off as an imitation of Yahoo. Here’s a brief post at the Google blog on the celebratory logo. 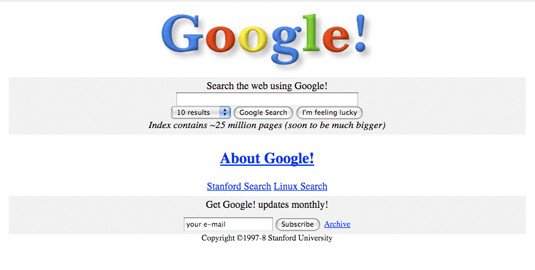 And here’s a gallery of special Google logos from over the years.